Aluminum base snaps open for quick sign changes. Unique design is perfect for establishments with a contemporary decor. Holds 8-1/2"w x 11"h signs, making it easy to print new signage. 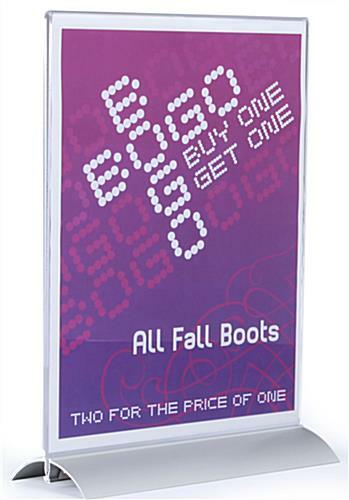 This desktop sign holder, also known as a display frame, features a unique construction that differentiates it from the same old image display. Place this print frame in a lobby or reception area to post important information for guests to read. 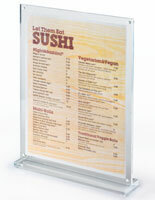 Usually, a desktop sign holder is constructed from a single material such as acrylic, plastic, or metal. This certificate frame is an exception to the rule. 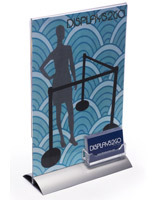 This display is a desktop sign holder constructed from multiple materials for a unique look. Passersby will certainly stop and take notice of the modern look of this fixture. 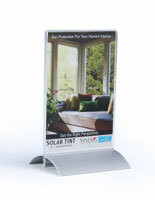 Each desktop sign holder, a poster display, has a base manufactured from aluminum with a brushed finish. The acrylic frame slides into a machined channel within the aluminum base. 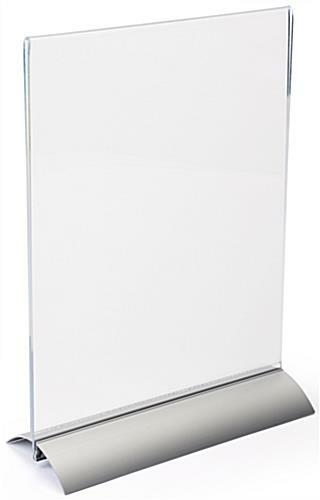 To allow for quick and easy graphic updates the bases of these desktop sign holders snap open and shut, allowing the acrylic frame to be removed. Once the acrylic frame is removed new signage bottom loads into the frame. 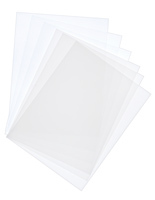 Each acrylic frame has polished edges, not frosted. 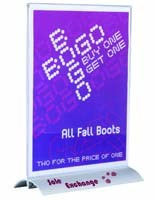 We sell this desktop sign holder at a discount price despite being made from premier materials. Order this picture frame in larger quantities to take advantage of the lowest prices. 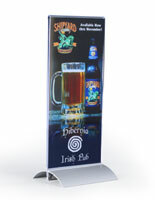 This display, desktop sign holder is ideal for use in any point-of-sale environment. 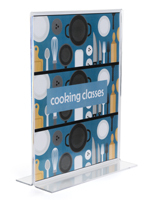 Hotels, banks, restaurants, retail stores, and offices love the contemporary style a desktop sign holder has. 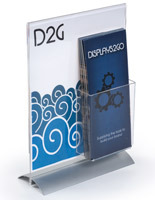 With a small foot print these sign holders take up very little room on a counter or desk. 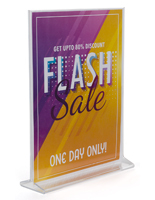 A combination of acrylic & aluminum construction, contemporary design, and low price point makes these sign holders a great deal! 8.6" x 14.0" x 3.3"
Great product - very sharp display. Thank you so much, Kirby! We take pride in our in-house manufactured Workshop Series of products, and we're glad that you found our acrylic sign holder to be sharp and professional. We hope you'll shop with us again soon! Well designed product, took a lot of searching to find it. The base separates which makes it easier to transport, and less risk of it breaking in transit. Thanks for the great review, Varun. We're happy that you found us! We were very happy with the product and our customer was pleased with the outcome BUT we only needed the base. If we could purchase the base separately, it is something that we might want to purchase in larger quantities and stock in our center. Better quality than an office supply store. I have an art business in which I do art on site with a list to choose from. This will help display designs. I needed something that would pack flat. The only solution I haven't found is a way to pack them so that they are light, and don't get scratched. I put all of my supplies in a duffle bag and would like these to fit in with everything else. These are definitely a higher quality than I purchased at the office supply store. We appreciate the feedback on your purchases, Tabitha! We look forward to working with you again in the future. These sign holders lay flat (because the base is a detachable piece) which makes them great for packing/transporting without the bases chipping and/or breaking all together.